Hair loss can be of many types and due to various causes. The commonest type in men is AGA or Androgenetic Alopecia, which as the name suggests is due to both, the androgens (male hormones) and genetic tendency (baldness that runs in families). It may start as early as teenage. As a rule of thumb, 20% of men in their 20s, 30% of men in their 30s, 40% of men in their 40s and so on will have AGA. Long story short, it is common and affects a large number of men (and women in their family). The treatment must begin with accurate identification of the type of hair loss, extent and any triggers/worsening factors. For a detailed discussion please schedule a consult with your doctor. Seasonal changes can sometimes dry out hair making it brittle, cause scalp trouble and worsen any existing hair loss. With the fluctuating weather and frequent travel, dandruff season can now last all year - the scalp can be itchy and flaky due to changes in air humidity and temperatures or stress eating and changes in hormones. Especially with long hair, tying too tightly (especially under a turban) or incomplete drying of roots after a swim / work out can further promote the growth of fungi that thrive in this environment and can cause dandruff, triggering or worsening hair loss. 2. Avoid anti dandruff shampoos as they tend to be harsh and dry the hair. 3. Any massage needs to be gentle and occasional as it can exacerbate hair fall by tugging at the already weakened roots. Stick to using your finger tips or a cotton swab for application of oil or serum. 4. Products: I love using anti fungal treatments and deep conditioning masks overnight. Look for water based hair styling products and remember that less is more. I do tend to avoid dry shampoos though they can be very convenient. 5. Diet and Supplements: Load up on green leafy vegetables and salads, with organic meats & eggs to get enough iron and protein to help your hair grow better. Anabolic sterois and some protein supplements, or medication can trigger hair loss. Thus don't self prescribe these. 6. Treatments: If you're still losing hair go see your doctor. They can assess various patterns and types of hair and scalp conditions and treat accordingly. The doctor may want to run some blood tests to eliminate medical causes of hair shedding/fall and start you off on topical and oral medication & supplements. 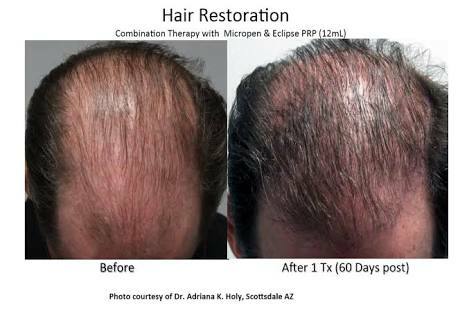 Treatments like monthly PRP injections (platelet rich plasma) & mesotherapy cocktails for the scalp can help accelerate this improvement and delay hair thinning & baldness and avert or delay transplants.